Sibella by Carrie Bostick Hoge. Seeing the picture below on Ravelry was the moment in which I fell in love with the patterns of Carrie Bostick Hoge of Madder*. And since that fateful day I have made so very many of her patterns. In fact it would be true to say that I have knitted more of her patterns than any other designer. Carrie has developed her own recognisable style based on simple shapes, beautiful stitch patterns and a gorgeous washed out colour palate. And her photos….well just look at the one below. Her photos inspire you to pick up the needles - yes? Carrie launched an Anthology of her patterns in the last week, bringing two of my favourite patterns of all time together; the Immie and Sibella pattern lines are joined by two other pattern themes, Camilla and Beatrice. As she explains at the start of the anthology she gets obsessed with a particular idea/stitch pattern and often designs multiple patterns around that theme. My two favourites both use the Frost Flowers design from Barbara Walker's A Treasury of Knitting Patterns. In Immie it is used as a panel up the front of the tee and with Sibella, Carrie has stripped out some of the elements and used them horizontally. I love this stitch and I love what Carrie did with it. Knitting Immie a few times and loving the stitch, inspired me to use a version of Frost Flowers when freestyling the Christmas Dress below. My little girl adored this dress! I plan on making another when time permits…maybe as an a-line jumper? Christmas Dress and photo by Felicia Semple. As I mentioned the other day, I have two of her patterns on the needles at the moment. The lovely Maeve and the Imogen Cowl. And these, like many other patterns I have used of Carrie's are simple, to the point, clear and have good descriptions of the various techniques involved. They aren't too verbose and they aren't too pithy. I really admire this in a knitwear designer, as it is something many patterns (including the few I have written!) fail to achieve. It makes them a joy to knit. Maeve by Carrie Bostick Hoge. Her patterns have that balance between nice finishing without being fussy. I love Lila for this - and will be knitting another in grey when I get the time. Just the right amount of garter on the neckline and the bottom give the sweater a nice balance. It is one of my most worn knits. Carrie's Uniform pattern is hopefully going to be knitted up by a good friend of mine - it will be her first grown up cardy and I think it is the perfect place to start. It is simple but with a great shape and in a good yarn weight for beginners. 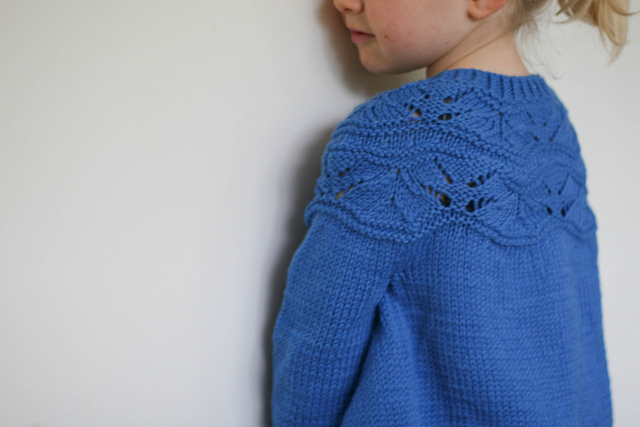 The pattern I am knitting at the moment, Maeve is another great example; it is so very very simple. It is a shrug and if you had told me a year ago I would be knitting a shrug I would have thought you were a little crazy. And then Carrie released this. Such a simple shape but so beautifully done. In my opinion, it is the width of the garter again that gives this pattern it's zing. Iphone photo by Felicia Semple of Maeve in Shilasdair DK. She makes beautiful kid patterns! Carrie started writing small person patterns after having a little girl. And the ones I have knit are some of my favourite baby/kid knits of all time. They are also the ones that have been most commented on by other people in a "did you KNIT that?" kind of way. I think it is because of the beautiful but simple lacework. I have also been meaning to make this pattern for a long time. And how cute is this. To sum up - I think that is what is so good about what she does. It is the fact that I could go on and on and probably on about how lovely the patterns are. There is so much to love. Have a look at the shop page on her website Madder to see all she offers. Her Anthology ebook is available now and there is a print version available for preorder. I can't wait to get mine in the mail. Have you knitted any of Carrie's patterns? Are you now inspired to do so? *Which in retrospect amuses me on some level, as it is the one pattern of hers I started and haven't finished… it is sitting there in the basket at home as a fully knit body and two finished sleeves….